I’m not one to go in for expensive knitting accessories when cheap, home-made alternatives are perfectly good. When it comes to stitch markers, loops of left-over yarn in a contrasting shade normally suite me perfectly well – unlike the plastic variety they stay put, and unlike fancy ones they have no awkward bits to get caught on stitches and can be cut off if they accidentally get knitted into the work (and sometimes I intentionally knit them into the work to mark a sideseam for example, if I don’t want to carry them on every row). I’m finding my latest project, Hannah Fettig’s Featherweight Cardigan a bit fiddly (laceweight on 4 mm needles) and the loops of 4 ply I was using as markers were getting in the way. My lovely handmade markers would have got caught on the delicate stitches. 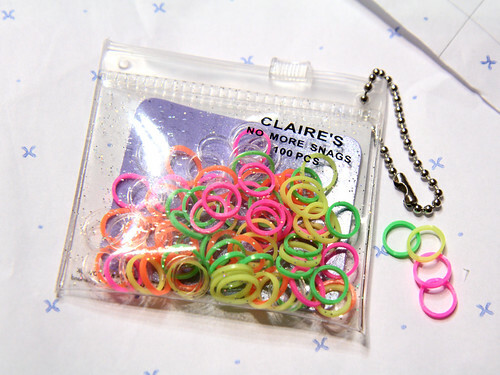 I found the perfect solution in these rubber hair bands from Claire’s. They turnout to be useless as hair bands – too small to manoeuvre onto my fingers to get round my hair – so I’m happy to have a use for them. They’re £2.50 for a pack of 100 and they’re neon, so easily visible against the yarn. They look like they’d fit up to a 6 mm needle and they can easily be snipped off if need be. I will be using these for all stitch marking purposes from now on. At a push I sometimes use little circles snipped off a drinking straw. Brilliant idea! I’ll look out for those. I like the variety of subjects you blog about, that’s right up my street.